105 RCACC is one of the two Cadet Units that belong to the 7th Toronto Regiment’s family. Located in Streetsville (Mississauga) Ontario, the Cadet Corps currently boasts a total of almost one hundred youth members. As a Training Unit, our objective within the Canadian Cadet Organization is to develop life skills for Canadian youth. This cannot be done without a dedicated staff. Unlike other branches of the Forces, much of the running of a Cadet Unit is dependent upon the dedication of unpaid Civilian Volunteers who come out every Tuesday evening Parade night to mentor, instruct and develop the youth members in the mandated Training syllabus, as well as coming out every Thursday evening and many weekends, to run optional activities such as our drill team, Band, Orienteering Team, Marksmanship program and biathlon programs, just to name a few. Much of what we do is not funded by National Defense nor the Canadian Armed Forces. The Corps Support Committee is integral in fundraising to pay rent and utilities of our Local Headquarters, Russell Langmaid Streetsville Cadet Centre as well as supplemental activities and bussing. Without their generated revenue streams, we could not operate. Currently there are eighteen volunteers and six Officers dedicated to making this program educational and challenging for the youth members. Below are Corps related biographies for most of these individuals. Cadet Master Warrant Officer Gabriel D’Souza is the Regimental Sergeant-Major. 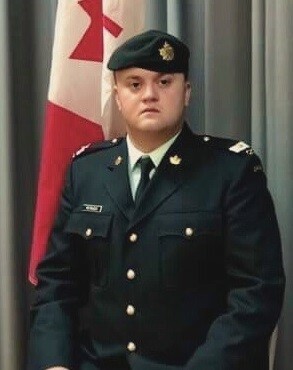 He joined the Royal Canadian Army Cadet program with 105 – 7th Toronto Regiment, RCA since he was 12, and is currently in his 5th year in the cadet program. 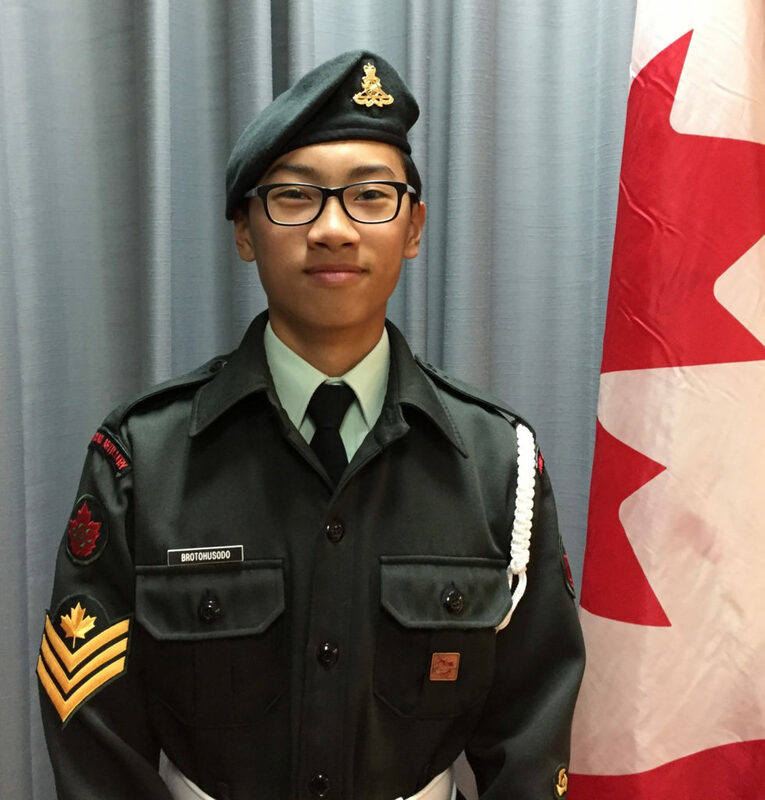 During his time in cadets, he has been active as a leader, volunteer, and learner. 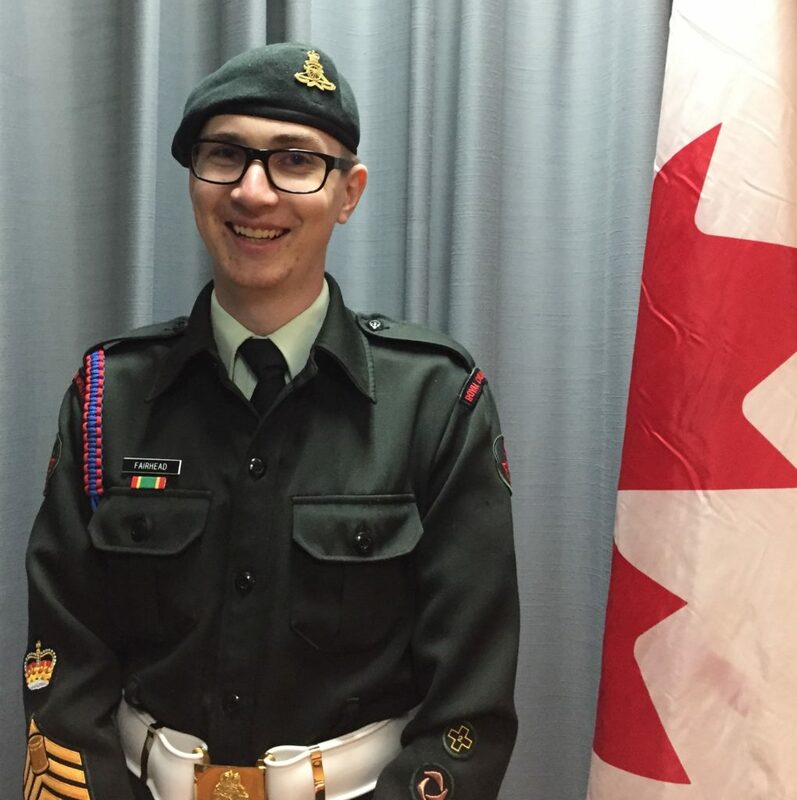 Through the Royal Canadian Army Cadet Expedition Program, he has learned how to become an effective leader, became proficient at field training, navigation, trekking, and wilderness survival. He has planned several unit exercises and assisted with the execution of those exercises. Within the unit, he has an extensive history of community volunteerism including leading various community clean-up efforts, Remembrance Day, Remembrance Vigil, among others. 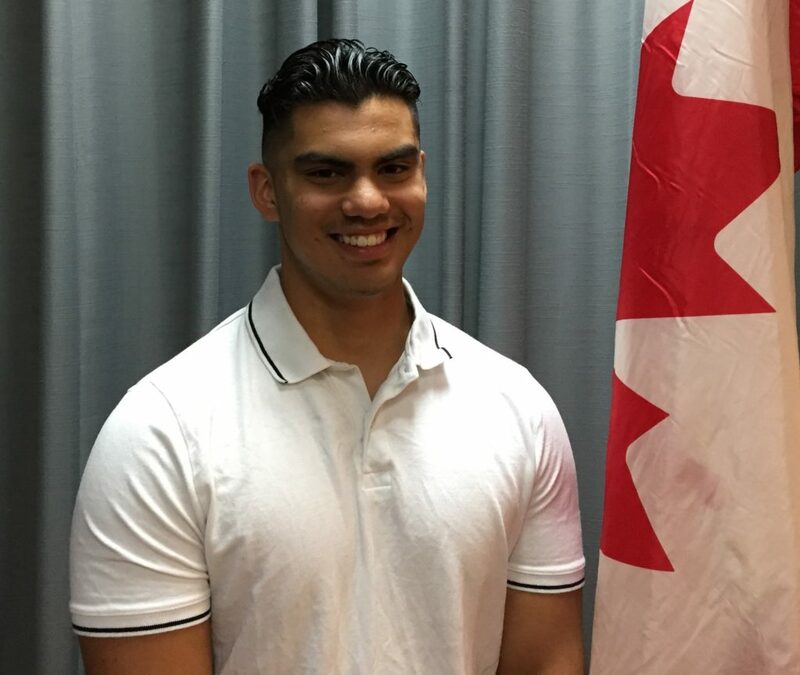 In Summer 2018, C/MWO D’Souza has been selected to attend the prestigious Leadership and Challenge Course at Rocky Mountain Army Cadet Summer Training Centre in Alberta. 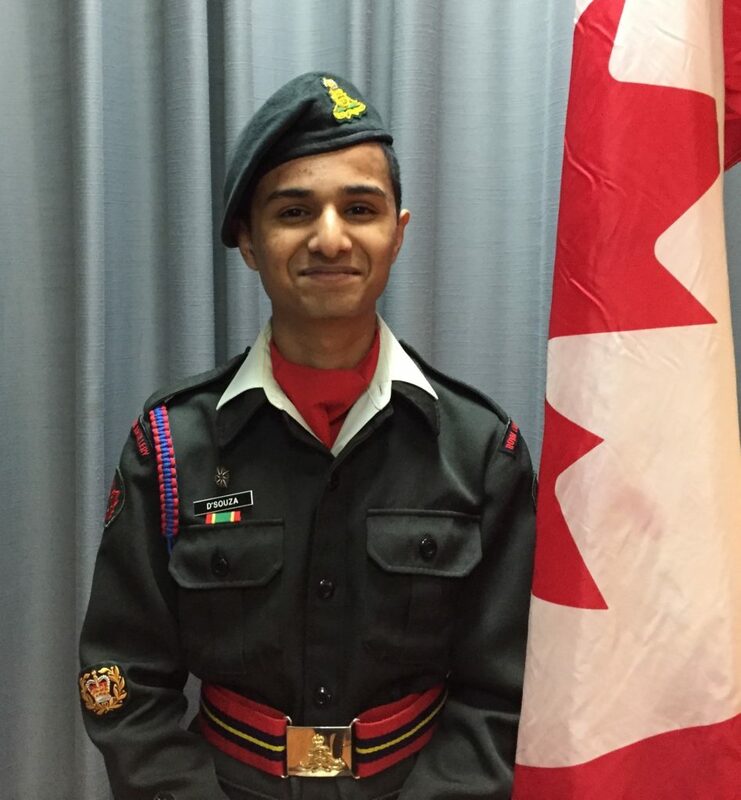 Outside of cadets, C/MWO D’Souza will be starting his final year of high school this September. He looks forward for his graduation and post-secondary education. Master Warrant Officer Andrew Fairhead is the Drill Sergeant-Major and Drum Major. Fairhead has been a member of 105 since November 2013. Prior to his appointment as the Drill Sergeant-Major, he has been the Band Drum Major, an appointment he has held since February 2016. He has been very active in Community Service activities both inside and outside of the Cadet Corps. MWO Fairhead is in his last year of cadets and will be leaving cadets in May of next year. He intends on applying to study film after finishing High School. This summer, he wishes to become a staff cadet at the Blackdown Cadet Training Centre. Sergeant Nathanael Brotohusodo was selected as the Flag Party Commander for the 43rd Cadet Annual Ceremonial Review. He has been a part of the 105 – 7th Toronto Regiment, RCA since he was 12, and is currently serving as a Troop Sergeant-Major. Within the unit, he has participated in several competitive operational teams, such as the Drill Team, Biathlon Team, and have shown keen interest in expedition. He is regarded by his peers and superiors as exemplifying the model cadet. 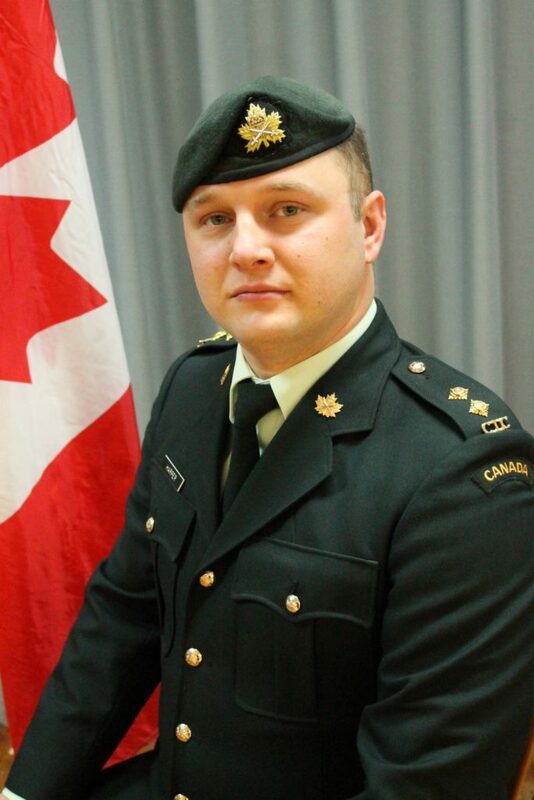 He has served in several capacity within the unit, and has excelled in community service having volunteered his time to teach drill lessons for St. John Ambulance Youth Division, a regular volunteer at the Royal Canadian Legion Branch 139, and in multiple remembrance occasion including the special service by the Ukrainian Canadian Congress. Captain R.E.I. Edelswärd, CD is currently the Commanding Officer of 105 RCACC, taking over Command from Major Paul Preikschas on 31 January 2017. Commissioning into the Canadian Armed Forces in March 1991 with 709 Toronto Communications Regiment, he spent eleven years, holding various appointments, culminating as Communications and Electronics Engineering (CELE)-qualified Captain. While in the regiment, he participated in two domestic Operations – RECUPERATION and ABACUS. In November 2000 he was attach-posted into 105 RCACC and shortly afterwards completed a transfer into the Cadet Instructor Cadre. He has held every appointment within the Corps, Commanding from May 2003 through to May 2006. In his civilian life, he has been a Scout leader for over seventeen years and volunteers with the Sovereign Order of St. John. 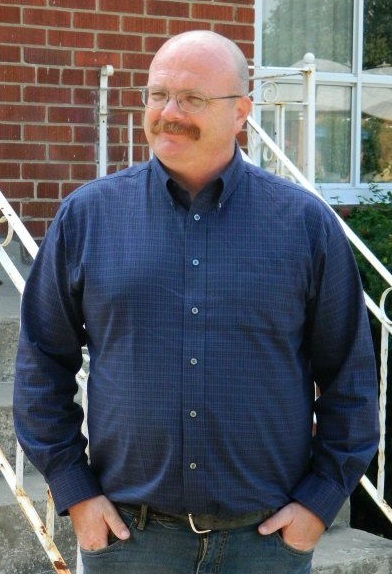 He retired from Canada Post Corporation, Operations after over thirty-two years of service this past February. He and his wife Susan have three children, Scott, 37, Tyler, 23 and Ellen, 22. 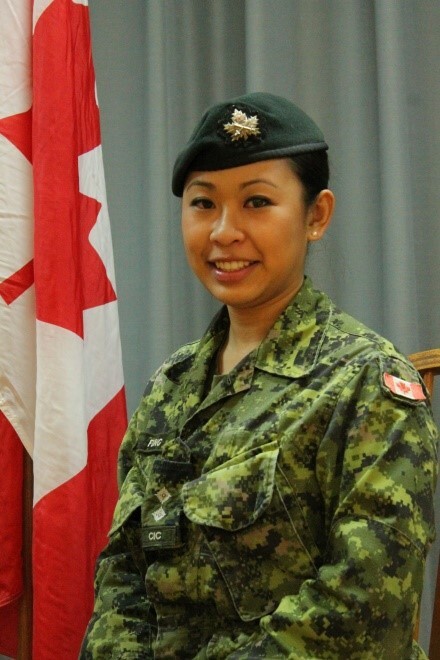 Lieutenant Bianca Fung has been working with 105 RCACC since 2012. At 105, Bianca is currently the Deputy Commanding Officer, Training Officer, and Unit Cadet Conflict Management Advisor. She is in charge of overseeing that all cadets receive their star level training effectively and succeed in meeting their performance checks throughout the training year. Bianca also works closely with the adult star level instructors to ensure that the instructional standards are met. She is also the coach for 105’s competitive marksmanship team. 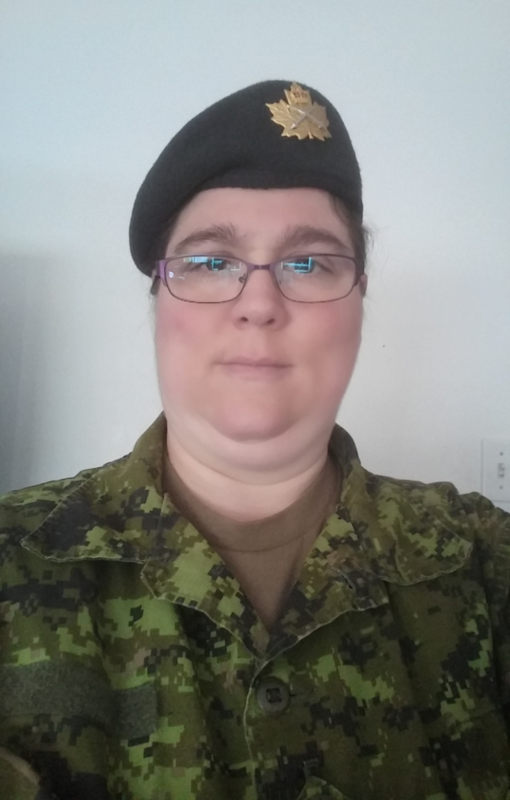 During the summer, she works at Connaught Ranges as the Head Coach for the Royal Canadian Army Cadet National Rifle Team (RCAC NRT). Bianca coaches cadets from all across Canada and Great Britain using the C11/C12 target rifle, shooting from distances between 100 to 1000 yards. She has led two Canadian cadet teams over to Bisley, England, in 2013 and 2016. She has her sights set on a future Commonwealth Games. Outside of her military life, she is a Junior-High school teacher. Lieutenant Kelvin Chu is currently serving as a Smallbore Range Safety Officer (RSO) and Unit Public Affairs Representative (UPAR). Chu is responsible for smallbore range safety, all matters related to public affairs and external communication, including media, community outreach and website maintenance. 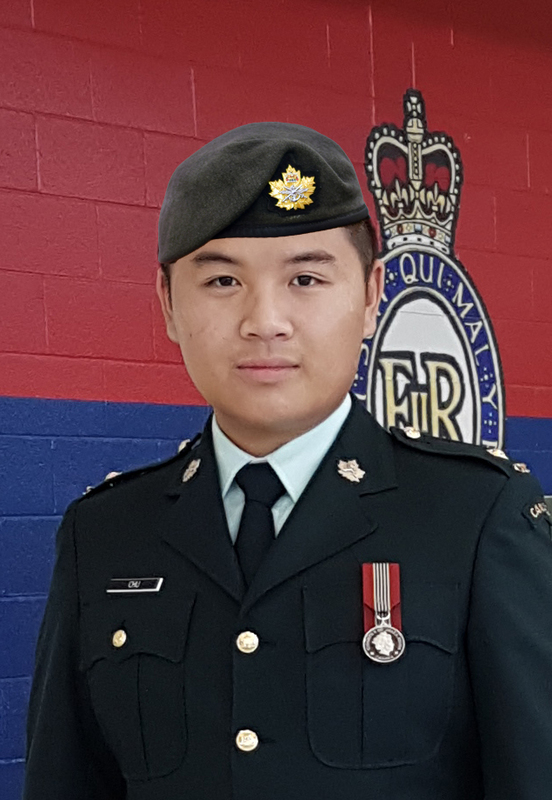 Lt Chu has been with 105 – 7th Toronto Regiment, RCA since 2013 when he joined the unit as a volunteer during his time in Primary Reserves. Over the years he has been Star Level Co-ordinator for Green and Red Stars (1st/2nd year cadets). During the summer of ’15 and ’16, he served as the Public Affairs Officer at Connaught Cadet Training Centre, responsible for all internal/external strategic communications and significant incident management. In 2016, he was awarded the Sovereign Medal for Volunteer by the Governor General of Canada. He will be moved to the 7 Toronto Regiment, RCA as an Artillery Officer in late 2018. In his civilian life, he works as Campus Police (Special Constable) with the University of Toronto Police. Lieutenant Neil Harper is the Corps’ Green Star Level Co-ordinator. The Canadian Cadet Organization has given him many opportunities and skills throughout the total of fourteen years being involved. Starting in September 2003 until November 2009 were the years he was a young cadet at the age of thirteen. After retiring from the CCO, he became a Civilian Volunteer learning the role of Band Officer until moving on to Supply. In June 2012, he was attested into the Canadian Armed Forces as an Officer Cadet in the Cadet Instructor Cadre Branch. The past few summers he have been a Platoon Commander at Blackdown Cadet Training Centre and at the 105 Royal Canadian Army Cadets in Streetsville have been an Instructor, and a Star Level Training Coordinator. Officer Cadet Matthew Petruzzi is the Co-ordinator for the Gold Star program (forth year Cadets). 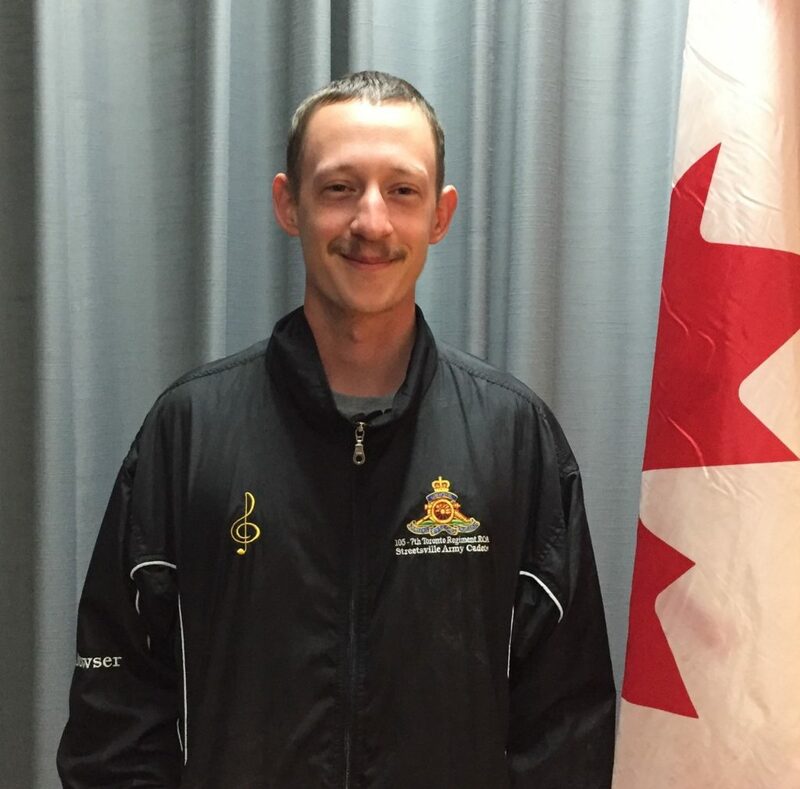 Matthew joined 105 Army Cadet Corps in January of 2014 as a Civilian Volunteer. He was given the pleasure of working in the Quarter Master Stores. As the Supply Officer he made sure the new recruits are given a uniform in a timely manner. He was just sworn in to the Canadian Armed Forces as an Officer Cadet in the CIC on the sixteenth of May 2017. Officer Cadet Shannon Pecore became a Reserve Force officer January 31st 2017. She have been with 105 for the past four years and am looking forward to continuing on with the Corps as an Officer and the current Administration Officer and Co-coordinator for the Master Cadet level of training. She was an Army Cadet as a youth and have been involved with the program on and off over the past twenty years in various capacities. 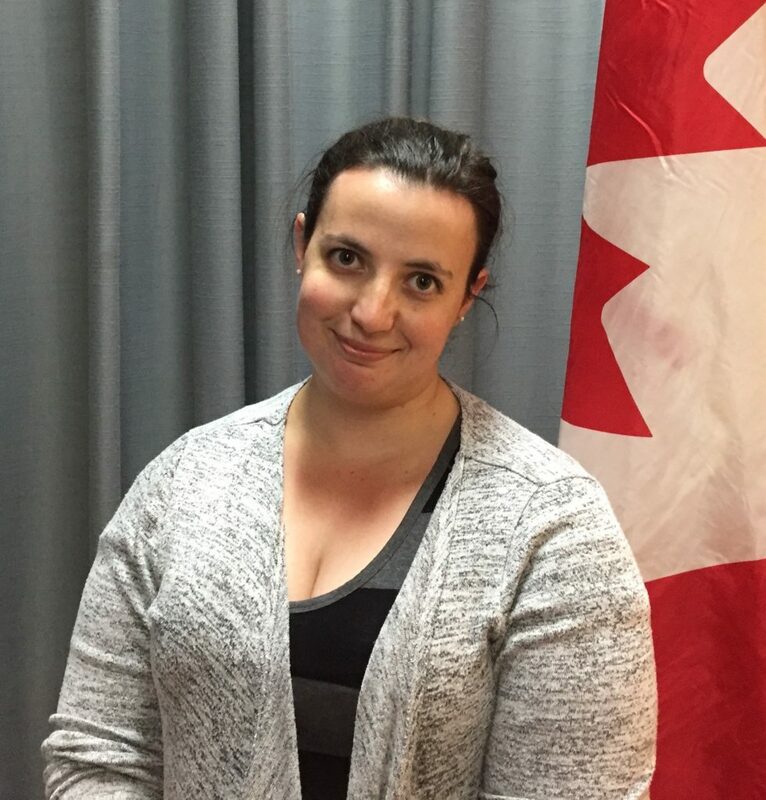 She have worked at Blackdown Cadet Training Centre as the Recreation Officer for a summer. 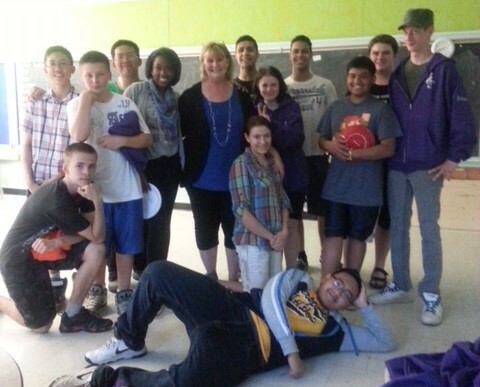 She love mentoring the youth and seeing them grow and mature into the leaders of tomorrow. The opportunities that the Cadet Program offers our youth are amazing and she look forward to continuing to promote it and give the cadets of 105 every opportunity to reach their goals. Recently, she have been appointed as one of the Regional Unit Public Affairs Representative. Civilian Volunteer Marissa Weir-Catnoir has always had the military as an integral role in her life as her father was in the Navy out on the East coast. She grew up on a military base where the east coast and military community was home. After moving to Ontario, she missed that community and closeness that she had down east and went in search of something that brought to her that sense of community back. She found that in the Cadet program. She began volunteering with 105 in 2014 and have taken on the role of Green Star (first year Cadets) Coordinator and the past two years she have worked with the Silver Stars (third year Cadets). Civilian Volunteer Brian Clark is the Corps’ Supply Officer and Adjutant. He joined 105 RCACC as a Civilian Volunteer in August 2016. A former serving member in the Canadian Armed Forces, he was a Gunner having served with 2 Royal Canadian Horse Artillery (RCHA), “D” Delta Battery, as the Battery Sergeant-Major’s Mobile Operator and as an Dangerous Goods (Ammunition) Driver in the Air Defense Troop from 1978 through to 1981 at Canadian Forces Base (CFB) Petawawa. In civilian life Brian worked in Film Industry and long haul mobile operator. 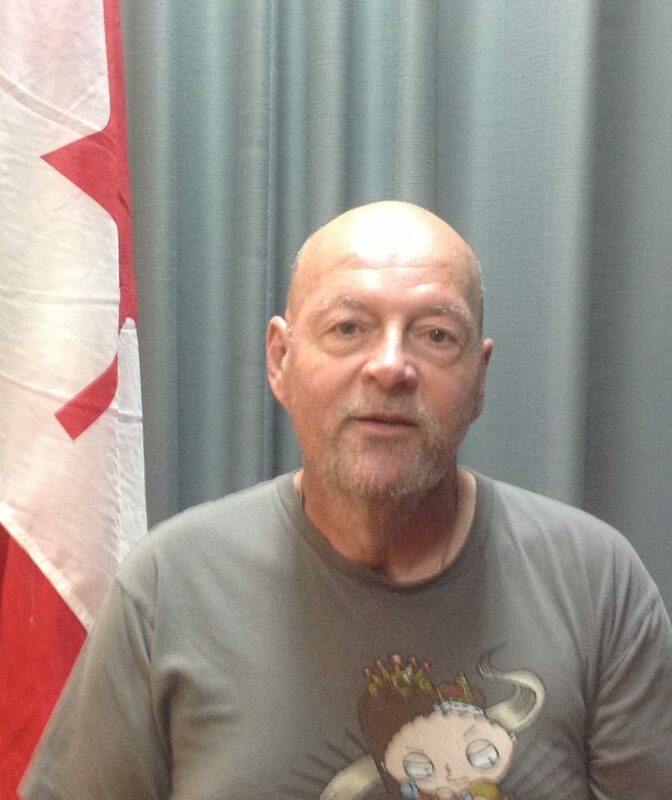 Civilian Volunteer Bob Kinch, CD retired from the Canadian Armed Forces as a Warrant Officer after serving for over 43 years. 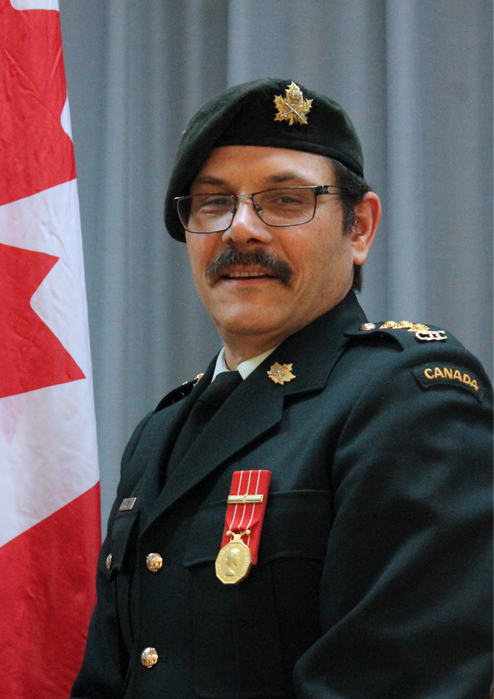 As a soldier, he spent 10 years of service with the Toronto Scottish Regiment and another 33 years with the 32 Combat Engineer Regiment, where he was a Troop Warrant Officer. He was a Range Safety Officer, explosive breacher, Winter Warfare and marksmanship instructor. His most notable achievement was his tours at the National shooting finals where he won the Canadian Forces Elite Fifty, 3 times. His last tasking was on Operation LENTUS where he built a bridge to a stranded island community in Laval in Fall 2017. His current position with the Corps is as a Co-coordinator for the Master Cadet level of training. He is currently in process of Commissioning From The Ranks to become an Officer in the unit. Civilian Volunteer Brennan Boughan is a former cadet in the unit, rising to the rank of Warrant Officer. Upon aging out, he opted to stay on as a Civilian Volunteer. For the past three years he has been a Star Level Co-ordinator and mentor for new staff in the Training Cell. As a former Corps Bandsman, he has continued to assist with the instruction on Cadet Bandsmen. All sports activities fall under his authority as the Unit Sports Officer. Currently Brennan is working his way through the recruiting process, endeavouring to become a Regular Force member in the Infantry. Civilian Volunteer Diego Perez was a former cadet Regimental Sergeant-Major at the unit, and is currently a soldier with the Toronto Scottish Regiment. Diego has been the Assistant Green Star Co-ordinator since December 2017 following his enrollment into the Army Reserves. Last Summer he attended the Leadership and Challenge Course in the Rocky Mountain National Cadet Training Centre. Diego has in previous years participated in Regional Expeditions and this was a great experience for him. He thoroughly enjoying the new adventure and challenges that the Reserves provides. Civilian Volunteer Linda Worsley, is the Corps’ Band Officer and Director. When her daughter joined 105 Streetsville Army Cadets I helped out where ever I could. Eleven years later, she has long ago aged out and I am still here. I have volunteered in many different areas but enjoy being The Band Director. Watching the cadets advance and grow is wonderful. I look forward to many more years with 105. Linda is assisted in the task of making fine musicians by CV Don La Rosa, CV Abdelrahman Abdelmagid and CV Brennan Boughan.